In an apparent celebration of the 25 year anniversary of the Kwik-E-Mart on The Simpsons FXX and 20th Century Fox are debuting a food truck transformed into a Kwik-E-Mart which will be travelling around the country. First stop? None other than SXSW on March 14-15 during the Interactive portion of Austin’s famous festival with other dates announced soon. Free Squishees will be offered as well as two flavors, Not So Very Cherry and Give ’em the Razz, a The Simpsons World experience demo with every episode with trivia, Kwik-E-Photo booth, and more. 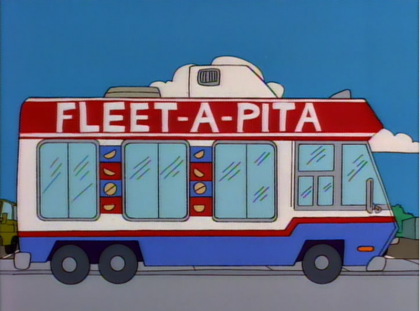 No word yet on competition from Fleet-A-Pita or any other pita or pretzel offerings. I read this article and found it very interesting, thought it might be something for you. The article is called The Simpsons Kwik-E-Mart Food Truck Comes to SXSW – Free Squishees! and is located at https://www.austincurrent.com/the-simpsons-kwik-e-mart-food-truck-comes-to-sxsw-free-squishees/.